DupScout Server provides the ability to categorize duplicate files by the file extension, file type, size, user name, last assess time, last modification time and file creation time. After finishing scanning the specified disks or directories, DupScout performs automatic file categorization and fills the list of detected file categories, which is located under the list of the duplicate file sets in the duplicate files search results dialog. In order to change the duplicate files categorization mode, click on the categories combo box located on the left size of the categories and filters control bar and select an appropriate duplicate files categorization mode. 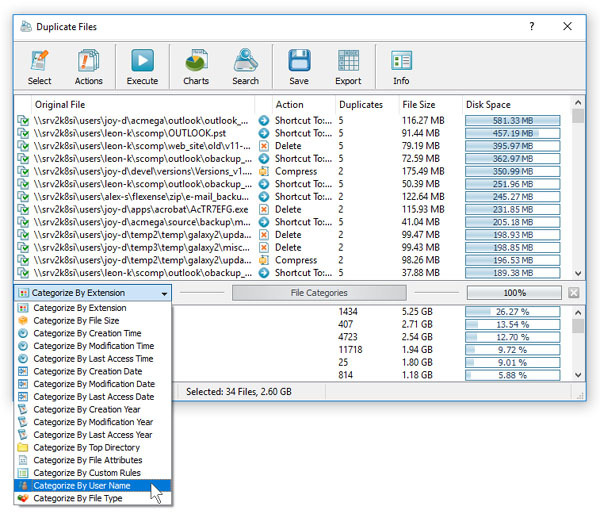 For example, in order to categorize duplicate files by the user name, select the 'Categorize By User Name' duplicate files categorization mode and DupScout will display the number of duplicate files and the amount of duplicate disk space per user. 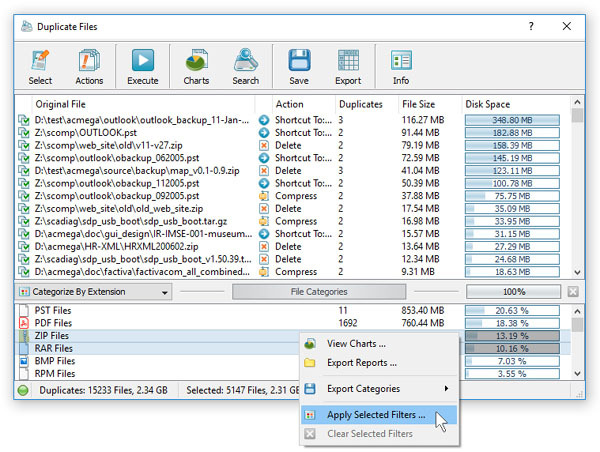 One of the most powerful capabilities of the DupScout duplicate files finder is the ability to filter duplicate files by the file extension, type, user name, size, creation, last modification date and last access date and then display charts, save reports and perform duplicate files removal actions on filtered duplicate files. For example, in order to filter duplicate files by one or more file extensions, select the 'Categorize By Extension' duplicate files categorization mode, select one or more file extensions, press the right mouse button and select the 'Apply Selected Filters' menu item. 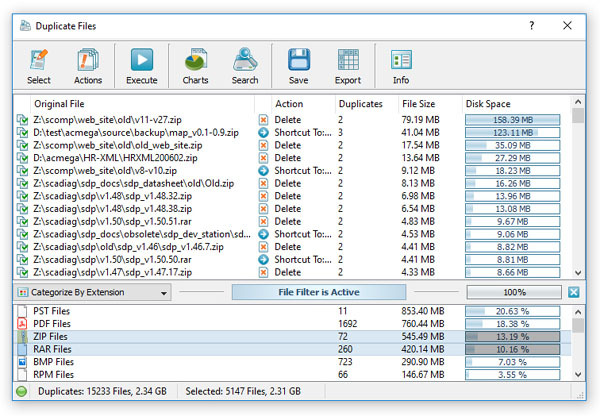 DupScout will filter duplicate files and display in the duplicate files results view duplicate file sets matching the selected duplicate file filters. When one or more duplicate files filters are active, all duplicate files search reports will display filtered duplicate files only. 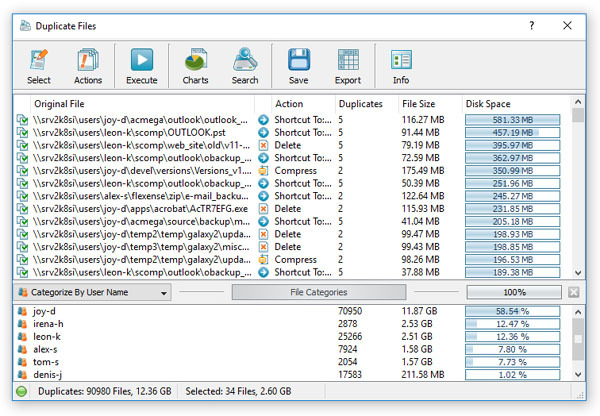 In order to reset the duplicate files filter, press the 'Clear Filter' button located on the right side of the categories and filters control bar. DupScout Server provides multiple types of pie charts capable of showing the number of duplicates and the amount of duplicate disk space per file extension, file type, file size, user name, creation date, last modification date and last access date. In order to open the charts dialog, press the 'Charts' button located on the duplicate files search results dialog. 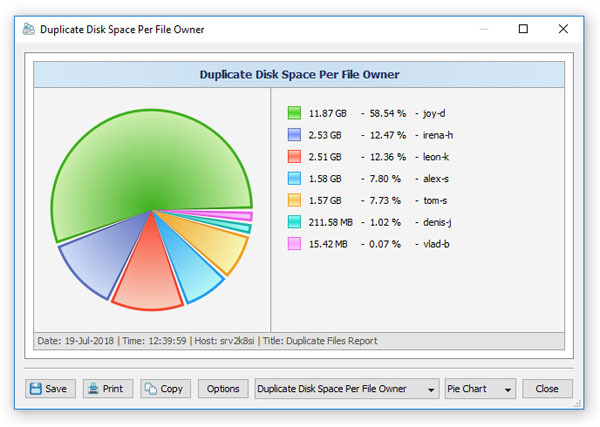 By default, the charts dialog shows the amount of duplicate disk space and the number of duplicate files according to the currently selected duplicate files categorization mode. 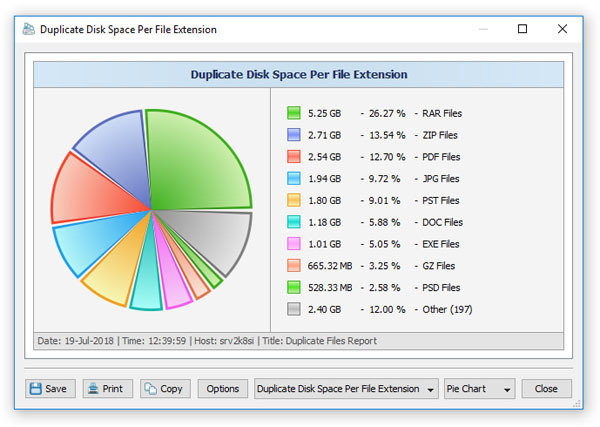 For example, in order to open a pie chart showing the amount of duplicate disk space per file extension, select the 'Categorize by Extension' duplicate files categorization mode and press the 'Charts' button. In addition, the charts dialog provides the user with the ability to copy the displayed chart image to the clipboard allowing one to easily integrate DupScout charts into user's custom documents and presentations. In order to edit the chart's description, press the 'Options' button and specify a custom chart date, time or title.